Today was especially hard for me because I thought my entire life was perfect in all aspects the, out of the blue, Diane told me she’d had enough of my shenanigans and wanted to be set free. So, I went down to the jail, paid her bail, and did just that. Her court date isn’t until, like June 1st, so we’ll have to come back and see what happens. Things were fine until she went to see “Thunder From Down Under.” You know, all those naked Aussies dancing and such. It was girls night out and she apparently had a really good time. It is an unspoken deal between the two of us that I will never asked what happened and she’ll never tell. I, on the other hand, had a very sedate evening sitting in our room, watching all the pretty lights until I got tired and had to go to bed. Alone. That was the first time in a very long time. Like years. 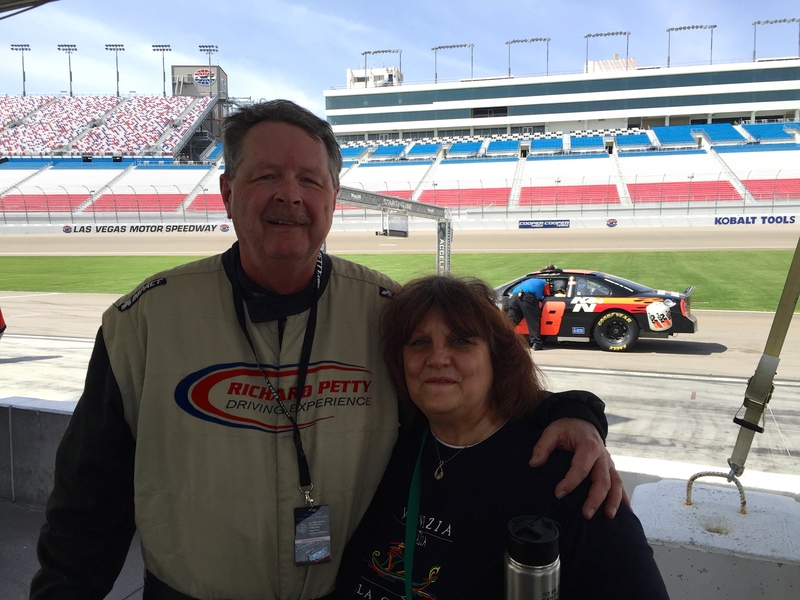 This morning, once I got her released, we went to visit Pat & Pat at their Worldmark condo on the southern part of the Las Vegas Strip so we could tag along with them to the Las Vegas Motor Speedway where he was going to make a few laps in a NASCAR race car. He was signed up to participate in the Richard Petty racing experience. 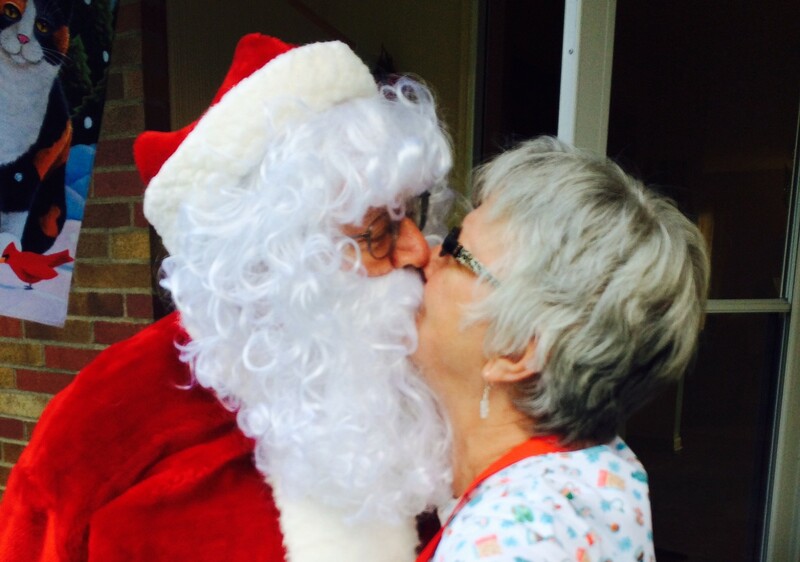 It was a special event and we were honored to have been invited to witness his experience and share in his joy. Diane, Short Pat, and I even got to participate, as observers, in the training evolution but we didn’t get to wear fire-retardant suit like Pat did. I, personally, felt cheated on that note because there were dozens of them just hanging there. Wouldn’t have hurt if they let me wear one, just for fun. But they wouldn’t. The training took place in the infield of the speedway which was quite a treat for us all because it’s such a huge place. Also, since it’s right next to Nellis AFB, we were treated to numerous F-18 fighter jets flying over as they practiced take off’s and landings. Pretty impressive. Diane loves that sound. Makes her swoon. Once out at the track, each of the drivers posed next to a Richard Petty 43 car before moving on to their assigned vehicle. Our Pat was the first one out since all the other drivers opted for the additional ride along with the pro driver to get the real feel of the track. Then one of the drivers cranked up one of the cars on the track. It’s the one they use to take drivers on a fast ride, like 165 mph, before they do it themselves with a ride along driving coach who has a kill switch should things get out of control. The sound of that car cranking up was an attention getter on a large-scale, especially since it was only about 10 feet away from us. Very thrilling. Diane had to sit down. 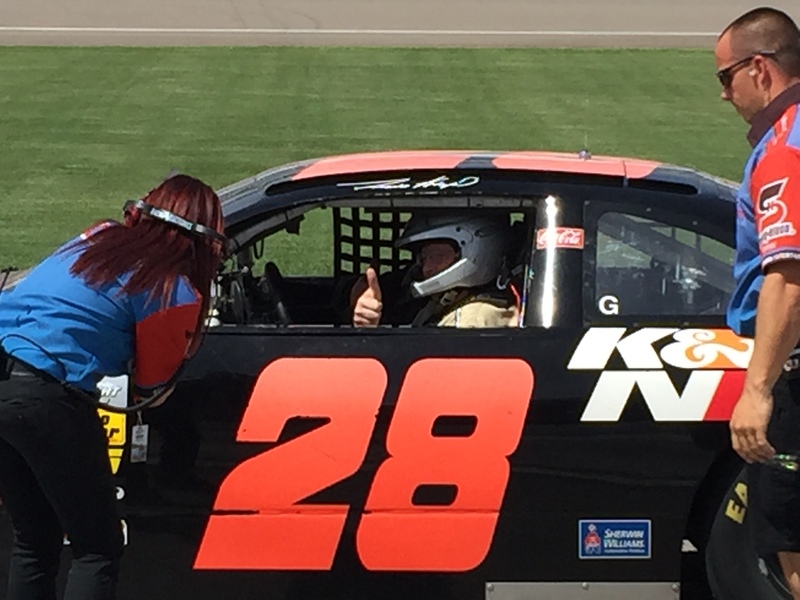 Then Pat got in his assigned car and flashed a thumbs up before starting the engine and entering the track for his attempt to hit all the gates and make the 1.5 mile trip as fast as he could. There was another fun looking car at the track but no amount of whining by Pat would have made it possible for the professionals to allow Pat inside the car. I don’t blame him. I wasn’t signed up to drive, and I ever whined a little. Looked like it might be a lot of fun. Once the ride was over, Pat exited the car and staggered back to our side of the barrier that kept us out of the pit area. Actually, I don’t think he walked at all … he kinda floated back with a really silly grin on his face which let us all know he’d just experienced the thrill of a life time. And we were there to see it. Below Pat and Pat share a moment in history that won’t soon be forgotten. Watch of the drivers got a video of their ride from inside the car, and I also took video of him each time he flew past us on the front straightaway. He was moving along very nicely. When it was all done he learned that he’d set a new track record for rookies of 155.3 and was immediately offered a sponsor so he could go pro. What an honor. He turned them down because he didn’t want to spoil the thrill of that initial ride and didn’t want to make it a job. Once it’s a job, it’s no long fun. It’s work. We left the track and headed back to town. On the way the girls did a search for a nice place to eat. They came up with an Italian place called Norman’s, or something like that, that was a little ways out of town, away from the strip. It was very authentic and the food was delicious. I had my forever favorite spaghetti ala carbonara. It’s really great stuff. Diane had raviolis, Tall Pat had spaghetti and meat balls, and Short Pat had tortellini. We were all well fed and thoroughly enjoyed the meal and the visit with Pat and Pat. Then we monied back to Worldmark and retrieve Diane’s new Impala. Sadly, it was time to bid adieu and go our separate ways. But, we know we will see them again soon once we’re all back in the Portland area. Here’s where we stayed. It’s one of the newer Travelodges recently acquired by Hilton and added to their expanding list of properties that we can use in our travels. Last night was festive over at the Gold Coast Casino where we had our PT Banquet. The food was good, the service was excellent, and everyone had a really good time. One of the more interesting events, in addition to the many PT related stories people told, was that one lady, from Colorado, who bought two $10 tickets for a 50/50 raffle, won on both tickets. She got 1st prize of $350, missed on the 2nd place $225, and one 3rd place for $125. Not a bad night. What incredible luck. This evening we went to see “Las Vegas, The Show” which is one we’ve seen on a previous visit. We chose to go again because it’s magnificent and we recommend it to anyone who has a notion to visit LV. Another draw was the theater is just around the corner from our hotel. Seriously, right around the corner. Now we’re back in the room and will pack before retiring with the intention of embarking on our homeward journey tomorrow, a day earlier than originally planned. The lady at the front desk was ecstatic when I told her she could have her room back a day early. We need to do this so we can make it back to St. Helens in time to attend Easter service at our church. So, I bid you farewell and have to point out that today is April 1st, and only part of what you’ve just read is true. You’ll just have to decide for your self which part. This entry was posted in Cars, Entertainment, Food, Friends, Opinions, Religion, Sports, Travel, True & False. Bookmark the permalink. 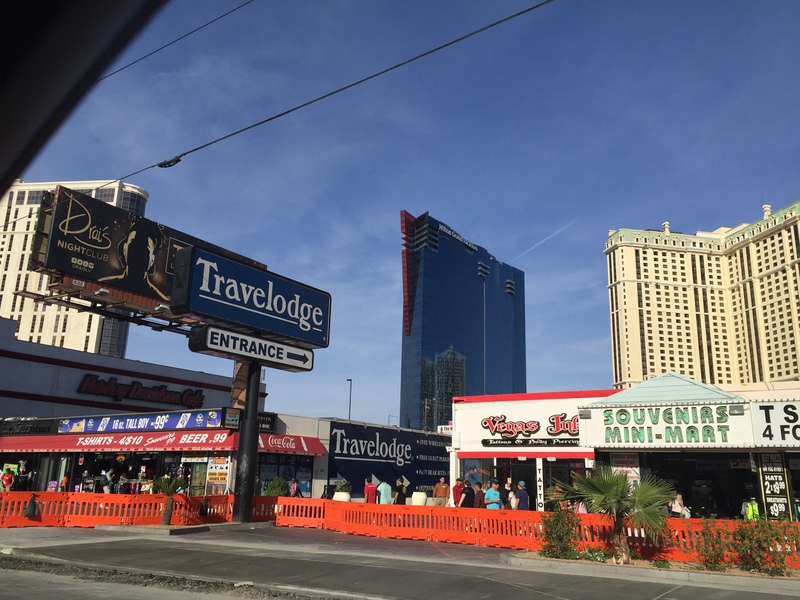 ← Viva Las Vegas ! !